This close-up shows ridges and ripples in ice on a rose hip in December’s ice storm. 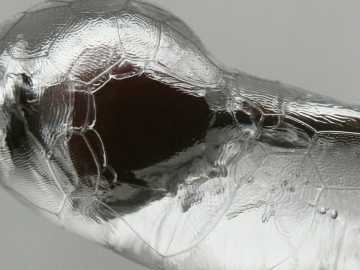 When freezing rain hit the twig, it transitioned instantly to the solid form, leaving an uneven, patterned surface. It’s a challenge to think kindly of ice, especially when ice makes things dangerously slippery underfoot, or when it encases the landscape in an ice storm. But ice can be a friend to living things. Here in Westborough, ice is certainly an acquaintance that we meet in various forms. Take the beautiful but damaging ice that coated everything in the great out-of-doors in December’s ice storm. That ice was brought to us by freezing rain. Freezing rain usually starts out as snow falling from clouds. On the way down, the snowflakes pass through a thick layer of warm air and melt into raindrops, and then the raindrops fall through a thin layer of very cold air. In these weather conditions, the raindrops don’t have time to freeze into the ice droplets we know as sleet. Instead, they become supercooled – chilled below the freezing point of 32 degrees F.
When the supercooled raindrops hit a cold surface, they freeze instantly on contact. The quick freezing sometimes produces a pattern of ridges and ripples on the surface of the ice, as revealed in the close-up photo of ice on a rose hip, taken during December’s ice storm. The ice also takes on the shape of whatever it hits, such as branches and wires. Freezing rain is relatively uncommon here in New England, but we’re better acquainted with snow. We may not always think of snow as ice, but this white stuff that we spend so much time shoveling in winter is also ice. Snowflakes form in clouds when water vapor turns directly into ice crystals, without first becoming liquid water. The process starts when tiny ice crystals form on minute particles that have been blown high into the atmosphere. These particles can be specks of dust or salt, or even bacteria. Snowflakes grow bigger as more and more crystals form on the ones that already exist. It’s hard to capture a snowflake long enough to get a close look at it, but snowflakes grow in various patterns. The patterns of ice crystals are based on six-sided shapes (hexagons) or six-pointed stars. For example, you can find six-sided plate-like crystals, six-pointed stars, and six-sided needles with pointed ends, and infinite variations. 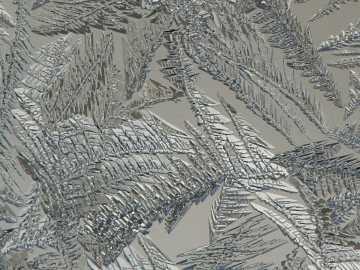 Like snowflakes, frost on a windowpane grows as ice crystals form directly from water vapor, creating the spiky structure in this close-up view. The frost that we notice on a windowpane in January, or on grass in November, is quite similar to snow. Frost forms much as snowflakes form. Water vapor turns directly into ice crystals, bypassing the liquid stage. Like snowflakes, frost needs something to form on. The ice crystals start on dust, small bumps and imperfections in a windowpane, or the texture of plants. Then frost grows as more ice crystals form on the ones that have gotten started. It can make fanciful feathery or spiky patterns like the ones in the close-up photo of windowpane frost. In contrast, when water vapor condenses into water droplets on a cold windowpane and these droplets then freeze slowly, the ice has a different look, as seen in the close-up photo of frozen condensation droplets. 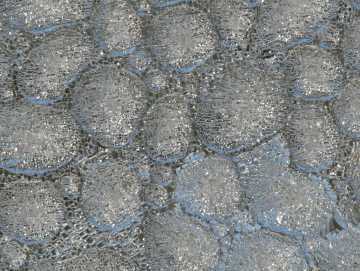 The large bubble-like shapes in the photo are frozen condensation droplets, and the many small lines on their surface are cracks that formed as the ice froze and expanded. These expansion cracks form for the same reason as ice floats: Ice takes up more space than liquid water. When water becomes ice, its molecules lock into place in an orderly way with respect to one another. They form a crystal structure, which has more space between water molecules than liquid water does. This extra space both causes the ice to crack and makes ice lighter than water. The ice floating on the surface of our lakes and ponds insulates the water below it from the frigid air above. This protection helps to keep the water from freezing all the way to the bottom, which allows fish to survive in our ponds throughout the winter. Folks who go ice fishing on Mill Pond also benefit, and they’re also likely to see and hear expansion cracks in the pond’s ice. Ice is a friend to other animals that take shelter in ice-protected waters during the winter. The turtles that we’re most likely to see in Westborough – painted turtles (Chrysemys picta) and snapping turtles (Chelydra serpentina) – spend the winter in the mud at the bottom of ponds. Safe from the freezing weather above, their body processes slow way down. The turtles can’t breathe underwater with their lungs, but their skin absorbs enough oxygen from cold water to keep them alive. Certain frogs that we commonly see and hear – bullfrogs (Rana catesbeiana), green frogs (Rana clamitans), leopard frogs (Rana pipiens), and pickerel frogs (Rana palustris) – also spend the winter in an inactive state at the bottom of ponds. These frogs would die if they froze. The bubble-like shapes in this close-up are water droplets that condensed on a window and then froze slowly. The tiny lines on the droplets are expansion cracks that formed as the droplets froze. Ice is a friend to life on a global scale. Just as ice moderates the temperature of water in a pond, it also moderates the temperature of our planet, but in a somewhat different way. The ice of earth’s polar ice caps plays an important role in slowing the global warming that we hear so much about these days. The ice caps send cold deepwater currents through the oceans, cooling them and the atmosphere. But the polar ice is melting relatively quickly, as we heard in 2008 when polar bears were officially listed in the U.S. as a “threatened” species because their habitat – sea ice – is disappearing. Scientists are concerned that once the polar ice is gone, global warming will speed up, making it even more difficult for humans and other life to adapt to the changing climate. So what do you think? Is ice a friend or a New England winter foe?